The first Provincial Grand Master of the Mark Province of Kent. A Provincial Grand Master without a Province? Before the sesqui-centenary celebrations of the Mark Province of Kent took place on the 14 December 2007 few of its brethren knew much about the Province’s first Provincial Grand Master namely Charles Purton Cooper, QC, MA (Oxford), LLD (Louvain and Kiel), DCL, FRS, FSA, MRSL, MRAS, MRIA, and corresponding member of the Royal Academies of Lisbon, Munich, Berlin, Brussels, etc. Who was this first Provincial Grand Master of the Mark Province of Kent? A perusal of his academic post-nominals illustrates that he was an extremely well educated individual with many international connections. Charles Purton Cooper was born in 1793, son of Charles Cooper a linen draper of St. Dunstan’s, London. His activity and industry were very great and he was a most prolific writer of legal publications. Charles Purton Cooper, usually known as Purton Cooper, became an outstanding lawyer and antiquary yet after a life of great industry and scholarship he died abroad in comparative obscurity. Purton was educated at Wadham College, Oxford, where he graduated on 7 December 1814 with a double first class honours degree. He was awarded his Master of Arts on 5 July 1817. He was called to the bar at Lincoln’s Inn in 1816 and after practising as an Equity Draughtsman he was appointed Queens Counsel in 1837. Purton was appointed a Fellow of the Society of Antiquaries in 1825. His great knowledge of jurisprudence and legal antiquities procured him a Fellowship of the Royal Society on 6 December 1832 as well as the LLD degree of the Universities of Louvain and Kiel. He was also Queen’s Sergeant for the Duchy of Lancaster from 1834 until his death in 1873. In 1834 Purton presented Lincoln’s Inn Library with 2,000 volumes on civil and foreign legal works having previously presented that Library with 150 volumes of American Law Reports. He became a Bencher of the Honourable Society of Lincoln’s Inn in 1836. He was Treasurer in 1855 and appointed Master of the Lincoln’s Inn Library in 1856. Purton fought enthusiastically for legal reform. This attracted the attention of Lord Brougham, Lord Chancellor in Lord Grey’s Whig Government by whom he was introduced to the Holland House Circle and the Heads of the Whig Party. On 12 March 1831 Lord Brougham appointed him Secretary to the Second Record Commission. A post he held until 20 June 1837 when it lapsed on the King’s death. Purton bought and printed so many books that the Commission’s debt over and above it’s authorised budget of £400,000, rose to £24,000. At one time Purton’s position was so prominent that Lord Holland recommended him for the post of Solicitor-General but he was not successful as a Mr Rolfe, afterwards Lord Cranworth, was appointed. Purton was a prolific writer of legal publications. His principal works are shown in Appendix A. Between 1850-7 he also published some 52 pamphlets, written, edited or printed by him on a range of political topics. Purton also played an active part in public affairs. In 1850 he was Whig Candidate for Lambeth but withdrew from the contest. He unsuccessfully contested Canterbury in August 1854 and March 1857. In 1855 he was proposed as a Candidate for West Kent but declined to stand. He lived at Denton Court, a Tudor Mansion, near Canterbury. Denton is just off the A2 road, halfway between Canterbury and Dover, although Denton itself is in the District of Dover. Purton Cooper was a member of the Camden Society for the publication of ‘Early Historical and Literary Remains’. He was a member of the Council of this Society as well as a Trustee. Other members were the Rt Hon Lord Francis Egerton (President); HRH The Duke of Sussex, KG, FRS, FSA; The Most Revd and Rt Hon The Lord Archbishop of Canterbury; The Rt Hon Lord Lyndhurst, LLD, FRS, Lord High Chancellor; and The Most Hon The Marquess of Northampton, DCL, PresRS, FSA. Purton enjoyed a leading legal practice in the Court of Vice-Chancellor Knight Bruce but unfortunately openly quarrelled with that Judge, quit the Court and lost his practice. His business consequently fell off and disappointment and difficulty overcame him. He endeavoured without success to obtain Government assistance for a project for digesting and sifting a settled scheme for all Law Reports down to that date. In due course he was obliged to retire in 1860 to Boulogne, France where after unsuccessfully endeavouring to carry on his projects of legal reform he eventually died of paralysis and bronchitis on 26 March 1873. So much for Purton’s most distinguished legal career. What is known of his masonic career? Purton states in his main masonic publication he was initiated in 1821. An article in the Maidstone, Rochester & Chatham Journal of 28 June 1853 describes his Installation as the Craft Provincial Grand Master for Kent, shown in Appendix B, and identifies his mother Lodge as British No.8. It was consequently established that he was initiated on 21 May 1821, in British Lodge No.8 his occupation being recorded as a Barrister. Purton never reached the office of Master of this Red Apron Lodge and never served as a Grand Steward. Purton subsequently joined United Industrious Lodge No.34, now No.31, at Canterbury in 1852. The 1854 Craft Provincial Annual Meeting took place at Sheerness. However a most unusual event took place before the actual Provincial Meeting opened. Namely that the Adams Craft Lodge No.184, later No.158, held an emergency meeting for the sole purpose of communicating the Chair Secrets to the Provincial Grand Master, RW Bro C. Purton Cooper. The Provincial Grand Secretary, Bro Charles Isaacs performed the Ceremony and Bro John Staples Keddell, ProvGSW designate, of Adams Lodge, presented the Provincial Grand Master. This clearly corrected a technical oversight when Purton was installed as Provincial Grand Master the previous year not then having been through the Chair of any Lodge. One of Purton’s first actions as Provincial Grand Master was to establish the state of Freemasonry in his Province by means of a survey and return from the Secretary of all lodges in Kent. This return requested details of the number of meetings and ceremonies performed; charities the lodge had subscribed to and details of returns made to Grand Lodge and to the Clerk of the Peace. At the same time the Worshipful Masters of all lodges were asked to submit suggestions to advance the state of Freemasonry in the Province. Purton was present at the 1854 Girls School Annual Festival but it was only on his arrival, finding senior brethren absent, he realised he had to propose the Health of Lord Londesborough. His training as a barrister stood him in good stead and he ably acquitted himself. He spoke about how long speeches were usual in the Court of Chancery but should be as brief as possible here. He referred how Masonry was expanding with Lodges in Turkey and other parts of Asia. Indeed he did not despair of one day seeing the Emperor of Russia himself made a Mason! Purton was eventually exalted on 5 May 1854 into British Chapter No.8 and became First Principal of that Chapter in 1858. He was then appointed Grand Superintendent of the Provincial Grand Royal Arch Chapter of Kent in 1858. Purton was advanced into Bon Accord Mark Lodge on 11 April 1856. Shortly afterwards Grand Mark Lodge was formed on 23 June 1856. The following year on 10 June 1857, Lord Leigh, Grand Master of the new Grand Mark Lodge constituted Mark Provinces and Provincial Grand Masters, with Kent being included in the first batch of eight Provinces. On 11 December 1857 Grand Mark Lodge confirmed the Grand Master had constituted Kent and appointed Charles Purton Cooper, QC, as its Provincial Grand Master. As previously indicated C. Purton Cooper had been the Provincial Grand Master for the Craft Province of Kent since 1853. 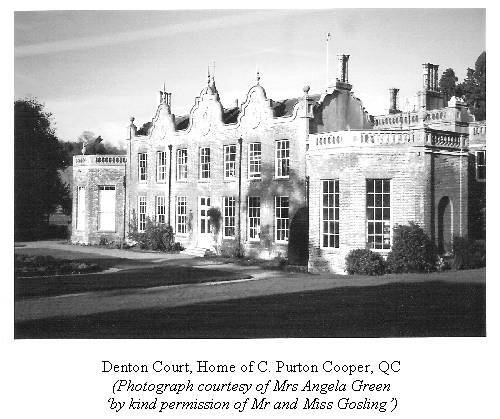 Andrew Prescott on page 22 of the book ‘Marking Well’ states support for the ‘Masonic Observer’ group came from men who were afterwards concerned in the establishment of Mark Grand Lodge such as the lawyer and erstwhile Secretary of the Records Commission, C. Purton Cooper, Provincial Grand Master for Kent. A footnote also indicates that Purton Cooper was a prolific contributor to the Freemasons’ Magazine. Purton Cooper was a Founder and Primus Master of Leigh Mark Lodge No.11, Erith in September 1857. Other Founders and Wardens of this Lodge were Thomas Bisgood, Craft DepPGM (1853 to 1859); and John Harvey Boys, Craft DepPGM (1859 to 1860). Despite such a high calibre of membership the Leigh Mark Lodge foundered shortly thereafter. There is nothing at all recorded about the Mark Province of Kent during Purton’s term of office but with Leigh Mark Lodge very quickly falling by the wayside and the only other Mark lodge then being Adams Mark Lodge No.6 at Sheerness, which was constituted in May 1857 but become dormant by the end of 1858, this is hardly surprising. Whilst the Mark Province of Kent thus had virtually no Mark Lodges shortly after Purton Cooper became its Provincial Grand Master, by the year 2008 it had become one of the largest Provinces in the English Constitution with some 60 Mark Lodges. Purton Cooper is often mentioned in the Freemasons’ Magazine as the Craft Provincial Grand Master. An abbreviated, though rather long report of the 1857 Kent Craft Annual Meeting is shown in Appendix C. An extensive report on the Annual Grand Lodge Festival that took place on 27 April 1859 in the Freemasons’ Magazine lists Purton as being in attendance. Interestingly the last Toast was to ‘The Ladies in the Gallery’, a tradition now faded away! Purton Cooper is also mentioned in the Freemasons’ Magazine as affixing his signature in 1859 to the By-laws of the newly formed Lodge of Instruction of the Royal Navy Lodge No.621, now No.429, at Ramsgate to which Purton signified his intention of becoming a member. The Royal Navy Lodge have however not been able to confirm Purton’s membership of their Lodge of Instruction but have confirmed that he did visit the lodge in October 1853 and their Minutes record that he explained the purpose of his visit and gave a concise history of Freemasonry. The Freemasons’ Magazine also records that there were nearly 100 present at the Consecration of Wellington Lodge No.1086, now No.784, at Deal on June 18 1859. The brethren assembled at Walmer Castle Hotel and processed to the Assembly Rooms where the lodge was consecrated. Stephen Barton Wilson, PGD, PProvGSuptWks(Kent) had been appointed by the Grand Master to consecrate the Lodge in the presence of Purton Cooper, Provincial Grand Master. Stephen B. Wilson was by profession an Architect and was President of the Emulation Lodge of Improvement. His mentor being the well known Peter Gilkes. The brethren afterwards adjourned to the Town Hall for the banquet. The Provincial Grand Master presided but was compelled immediately afterwards to leave for London. Purton was also listed as being present at a Special Grand Lodge Meeting on 23 June 1859 to consider items carried forward from the previous Meeting, with Purton contributing to the discussion about the Grand Secretary’s salary. A report on the Centenary meeting of the Grand Master’s Lodge No.1 also lists Purton present as a visitor. One of Purton’s ambitions as the Craft Provincial Grand Master of Kent was that every lodge in Kent should be a Life Governor of the two masonic Schools. Ten of the fourteen lodges in the Province had achieved this by 1858. It had always been Purton’s habit to read everything written relative to the management of the Order. Up until 1858 it had been the practice to open Provincial Grand Lodge within a private Lodge. When it was brought to Purton’s attention that the private lodge was thus never able to close he immediately saw how illogical this was and changed the practice so Provincial Grand Lodge opened up independently. Bro. Yoshio Washizu’s ‘Notes on Masonic “Fire” ’ in AQC 111 (1998), p.162 refers to RW Bro Purton Cooper giving the loyal toast at the Provincial Annual Meeting in 1859 and the anecdote he relayed, followed by ‘Kentish Fire’ unknown to today’s Kent brethren. Surprisingly for such a distinguished individual it has not been possible to discover a photograph, a portrait, or any image of Charles Purton Cooper, QC. Although at the 1858 Craft Provincial Meeting Purton himself presented a lithograph portrait of Bro Ashley, a Past Master of the Royal Kent Lodge of Antiquity No.20 and very popular PastDepPGM in recognition of his past services. The following sources have confirmed they do not hold an image of Charles Purton Cooper: Lincoln’s Inn Library; Great Queen Street Library and Museum; Kent Masonic Library and Museum Trust; Canterbury Reference Library; The Centre for Kentish Studies, Maidstone; The Royal Society; The Society of Antiquaries: The Society of Antiquaries of Scotland; The National Portrait Gallery; The British Museum; Victoria & Albert Museum – their Word & Image Department incorporates the National Art Library and the Museum’s Prints Drawings, Paintings & Photographs Collections. Do you know where a photograph, portrait or any image of Charles Purton Cooper, QC, is held? If so, the author would be delighted to hear from you. The Oxford Dictionary of National Biography. The Maidstone, Rochester & Chatham Journal of 28 June 1853. The Freemasons’ Magazine (various dates). Washizu Y., ‘Notes on Masonic “Fire” ’, AQC 111 (1998), p.162. Charles Purton Cooper’s main Legal Publications. An Account of the Parliamentary Proceedings relating to the Practice in Bankruptcy, Chancery, and the House of Lords – 1828. Notes, etc., in French on the Court of Chancery – 1828; 2nd edition 1830. Notes on Registration and Forms in Conveyancing – 1831. Speech for Rev. C. Wellbeloved in the Case of Lady Hewley’s Foundation; Attorney-General v Shore – 1834. Notes on the Act for Regulating Municipal Corporations – 1835. Select Cases decided by Lord Brougham in the years 1833 and 1834 edited from His Lordships original MSS – 1835. Reports of Cases decided by Lords Cottenham and Langdale and by Vice-Chancellor Shadwell in 1837 and 1838 with notes 1838-41. Reports of Cases in Chancery decided by Lord Cottenham – 1846. Letter to the Lord Chancellor on law defects in the custody of lunatics – 1849. A pamphlet on the Reform of Solicitors’ Costs – 1850. Letter to Sir George Grey on the Sanitary State of St. George’s Parish – 1850. A pamphlet on the condition of the Court of Chancery – 1850. A pamphlet on the Masters in Chancery. A pamphlet on the House of Lords as a Court of Appeal. Chancery Miscellanies under his editorship Nos.1-13 – 1850 and 1851. Parliamentary Miscellanies under his editorship Nos. 1-20 – 1851. Letter on Pope’s Apostolic 1850-1 Letters. A pamphlet on the Government and Irish Roman Catholic Members – 1851. Reports of Cases & Dicta in Chancery from MSS, with notes Nos.1-7 – 1852. Memorandum of a Proposal to Classify the Law Reports, Boulogne – 1860. A similar Proposal for Digesting the Statute Book, Boulogne – 1868. It should be noted that Purton was appointed by the Public Records Commission to locate all significant State records in England, Scotland, Wales and Ireland, describe their physical condition and summarise their contents. This extraordinary body of material includes such landmarks as The Statutes of the Realm, The Exon Domesday and the Red Book of the Exchequer. Purton fulfilled this daunting task with enviable skill. What is more he added detailed annotations that discuss the significance, reception history, provenance and other notable features for each record. First published more than 175 years ago this study remains to this day an incomparable guide to such records of State. The Maidstone, Rochester and Chatham Journal of 28 June 1853 reported on Purton’s Installation as the Craft Provincial Grand Master of Kent at Folkestone on 20 June 1853. This newspaper article states that numerous brethren from British Lodge No.8 were in attendance with Purton himself being a member of that Lodge. The newspaper reported that the Installation day in 1853 was remarkably favourable and at an early hour the inhabitants of the neighbouring villages thronged into town. The Provincial Grand Lodge was opened and that part of the ceremony to which the public was not admitted was performed in the Guildhall. At one o’clock the Procession was marshalled, headed by different Kentish lodges with their Standards and Banners. The principal were those of Maidstone, Margate, Gravesend, Chatham, Ramsgate, Dartford, Sheerness, Dover, Hythe, Folkestone and Canterbury. Visitors included many Grand Officers of the United Grand Lodge of England. Among the visitors, a Hindu, a fine-looking man in native costume, attracted much attention. There were also present members of French lodges in their peculiar clothing. The procession moved through the principal streets, which were crowded, to a full Church. After the usual service of the day an anthem was sung written for the occasion by Brother How, composed and arranged for three voices by Brother Phipps, the Provincial Grand Organist. The Rev. David Jones, the Provincial Grand Chaplain also preached an impressive sermon. The procession reformed and returned through a different part of the town to the Guildhall where the newly-installed Provincial Grand Master, the business of the day having been transacted, closed Provincial Grand Lodge in due form. Later a banquet was served at the Pavilion Hotel at which many brethren were present. Many however were compelled by their avocations to leave previously for London and other places. Suitable Toasts were drunk with great enthusiasm. Nearly fifty years have elapsed since such a Masonic Festival has been held at Folkestone. Nothing of the kind has ever passed off more happily. It is said the Provincial Meeting next year would be held at Sheerness or Canterbury but the choice of the place at which the Meeting is held rests with the Provincial Grand Master. The Craft Provincial Annual Meeting of Kent in 1857. Although no Mark Provincial Meeting took place 150 years ago in 1857 there is an extensive report in the Freemasons’ Magazine of the Craft Provincial Annual Meeting that took place that year. As events in 1857 vary somewhat from similar events of today the following abbreviated, though long, report is included for those who may be interested. The Provincial Grand Lodge of Kent was held at Canterbury on Monday 15 June 1857. This event excited considerable interest, as such a meeting had not been held in Canterbury for nearly half a century. Indeed the last Provincial Grand Lodge held in Canterbury took place in 1808. Why was this? Well in some measure it may be attributed to the fact that the only Lodge in Canterbury, the United Industrious No.34 had been almost allowed to die from exhaustion not having more than two or three members! In the last few years great efforts had been made to revive it. This was so successful that it now ranked as one of the most respectable Lodges in the Province. (The fact that Purton Cooper, QC, the Provincial Grand Master joined the Lodge in 1852 doubtless played a significant part in its revival.) Accordingly Purton Cooper was determined to hold his Annual Provincial Grand Lodge this year in Canterbury. On the previous Sunday evening there was a goodly attendance of Brethren in the Masonic Hall, St. Margaret’s Street when Bro. Stephen Barton Wilson, JGD delivered a very effective lecture on the objects and scope of Freemasonry. He was unanimously accorded a vote of thanks. On the Monday morning after a sumptuous breakfast at the Rose Hotel in the High Street the brethren proceeded to the Freemasons’ Tavern where the large Concert Hall was arranged as a lodge room. The lodge was opened with the usual ceremonies in excellent style by Bro Holttum, Worshipful Master of United Industrious No.34 assisted by his SW and JW. RW Bro Purton Cooper, QC, the Provincial Grand Master and his Provincial Grand Officers then entered the Lodge and were received with the customary formalities under the direction of the excellent and experienced Master of the Ceremonies Bro Poussett. Provincial Grand Lodge was then opened. Amongst the brethren on the dais were Bro Ashley, PProvDepPGM, Bro Harvey Boys, PProvGSW, Bro Brook Jones, PProvGSW, Bro W.H. Vale, PProvGSW (Herefordshire), Bro Hyde Pullen, DepPGM (Isle of Wight) and several Provincial Grand Officers. The Minutes of the last Provincial Grand Lodge were read and confirmed. Bro. Saunders was re-elected Treasurer and the officers of the year were appointed and invested by the Provincial Grand Master. The Provincial Grand Master said that Bro Phipps, ProvSGW had for many years held the important and pleasing office of Provincial Grand Organist. He spoke at length about Bro Phipps attributes as both a working mason and a charitable brother. The Provincial Grand Master then invested Bro Pike as ProvGJW, Bro Windeyer as ProvGReg and Bro Tolputt, who is blind, as ProvGOrganist in each case listing their respective attributes in considerable detail. ‘Presented to Brother Charles Issacs, Past Master of Lodge No.20, Past Provincial Grand Senior Warden and Provincial Grand Secretary by the Provincial Grand Master and Brethren of the Province of Kent as a mark of esteem and regard and in grateful appreciation of his zealous and efficient services during a period of twelve years. A procession was shortly afterwards formed to the Cathedral headed by the Band of the 3rd Dragoon Guards playing as a march ‘The Free and Accepted Mason’. The passage of the procession of the Provincial Grand Officers up the magnificent nave of this glorious edifice presented a spirit-stirring scene, the rich colours and the glistening jewels which most of these distinguished Brethren wore contrasted in a picturesque manner with the pushing crowd around them. The Cathedral was densely crowded and the Venerable Archdeacon Harrison the Canon in residence exhibited great anxiety that all should be well accommodated. The service was most effectively performed although the strength of the choir was diminished by several of its choicest singers having gone to the Handel Celebration at the Crystal Palace. The Revd R. Hirst, minor Canon said the prayers and the anthem was from Psalm cxxxii ‘Lord remember David’. The Revd Bro Kingsford preached the sermon who took for his text 1 Tim. ii. 5 ‘For there is one God’. The preacher in dwelling on the great aim of the Apostle to promote unity and harmony observed that there were few societies more active on this behalf than that of the Freemasons, the principles of which proved its Divine origin, principles the very opposite of those generally professed by mankind, for the disposition of mankind was naturally selfish. The Provincial Grand Chaplain then developed this theme into an extremely lengthy sermon. At the close of the service a collection was made at the doors on the joint behalf of the Kent and Canterbury and the Masonic Charities. The result was a sum of £20. The route taken by the procession from the Cathedral to the Lodge room on its return was by Burgate and St. George’s thus more than quadrupling the distance gone over on proceeding to the sacred edifice. On resumption of Provincial Grand Lodge thirty guineas were voted from the Charity Fund to be given in the names of Dartford and Canterbury Lodges by which they became permanent governors of the masonic Girls’ and Boys’ School. Votes of thanks were given to Archdeacon Harrison and Revd Bro Kingsford, the former for his courtesy in allowing them the use of the Cathedral and the latter for his admirable sermon, after which the Provincial Grand Lodge was closed in ample form. The brethren then proceeded to the Corn Exchange where Bro Bretton, the indefatigable Landlord of the Rose had prepared a sumptuous dinner. At the table d’honneur were Bros Purton Cooper, Provincial Grand Master (in the Chair); Bisgood, DepPGM; Ashley, PDepPGM; Harvey Boys, PProvSGW; the Revd M. Kingsford, ProvGChap; Saunders, ProvGTreas; Isaacs, ProvGSec; Pullen, DepPGM for the Isle of Wight; Warren, Grand Stewards’ Lodge; J. Delmar, PProvSGW; Vale, PProvSGW for Herefordshire, etc. In other parts of the room were various brethren. The numbers of Brethren at dinner were upwards of 150. After dinner grace was sung by Bros Donald King, Young, Lawler and Kingsbury, who afterwards sung in admirable style, a variety of songs, glees, etc. Upon the removal of the cloth the Provincial Grand Master said that he had now the pleasing duty to perform of proposing a toast, which was always acceptable to Masons ‘The Health of Her Majesty’. They had always had the good fortune in England of having their Masonic rites patronised by royalty. Canterbury had borne no small part in the history of Freemasonry. Not to go back into earlier ages he found that in the reign of Edward III some very important masonic operations took place in Canterbury, so important that the King thought it first necessary to revise the Constitutions with his own hand. Other important business was transacted in Canterbury in the reign of Henry IV. Then when they came down to the time of her Majesty’s ancestors they would find that they had invariably practised Freemasonry. Her Majesty’s august father was a mason, so also were all her uncles with one exception and had her illustrious uncle the late MW Grand Master, the Duke of Sussex lived a little longer there could be no doubt that although he would not say the Queen would have been a mason, Prince Albert would have been enrolled in their ranks. They were now entering on another generation and he had no doubt that ere long the Prince of Wales would be numbered in the Craft. The Princess Royal could not be but she was about to marry into a family the members of which were celebrated from the time of Frederick the Great as being promoters of Freemasonry and he believed that Prince Frederick was already a good Freemason, if he were not he was sure he would become one. He begged to propose ‘The Queen and the Craft’. The toast was drunk with loud applause. The Provincial Grand Master then gave ‘The health of the MW Grand Master of England, the Rt Hon The Earl of Zetland’. It had been the fortune of the noble Earl to live in an age of masonic transition and should he now be approaching the close of his masonic career the brethren would always regard with admiration the firmness with which he had carried them through that period and for the excellent appointment of officers recently made. During the reign of the noble Earl Freemasonry had greatly progressed, the number of Lodges, which were less than 730 when he became Grand Master having increased to upwards of 1,000 and he was sure his Lordship had won for himself the respect and love of every member of the Craft. (Applause.) The Provincial Grand Master next gave ‘Lord Panmure, the Deputy Grand Master of England and the Grand Officers’. He was sure Lord Panmure would prove a most valuable and efficient officer and though Minister of War his masonic principles would ever keep him from running the country unnecessarily into war. With the toast he wished to couple the name of a brother who was distinguished not only by his connection with the literary organ of the Craft (the Freemasons’ Magazine) but for his high masonic attainments and independence of conduct. He proposed ‘Lord Panmure, Deputy Grand Master and the rest of the Grand Officers coupled with the name of Bro Warren’. The RW Provincial Grand Master then proposed the health of their excellent brother the Provincial Grand Chaplain to whom they were so deeply indebted for his eloquent and truly masonic sermon. He only regretted he was not in a position to do so or he should have great pleasure in making Bro Kingsford a Bishop. (Cheers & laughter.) Bro The Revd Kingsford briefly responded assuring the company that as a member of United Industrious Lodge No.34 he was always happy to meet them and he was deeply grateful to the RW Provincial Grand Master for having raised him to the dignity of ProvGChaplain. He was as yet but a humble curate but whatever position he might hereafter hold he should never forget the kindness he had received from their hands. The Provincial Grand Master said the next toast was one he really ought to call the toast of the evening, he meant ‘The health of the brethren whose hospitality they were enjoying, the Worshipful Master and brethren of the United Industrious Lodge’. (Loud cheers.) It was nearly fifty years since a Provincial Grand Lodge had been held in that ancient city. It was then held under the auspices of the Earl of Moira, the then Grand Master and presided over by the great-grandfather of Bro Windeyer who had that day been invested with purple honours. (Cheers.) The fact that they were assembled on a peculiar spot, which of all our native isle was the first to be civilised in the most ancient city of the United Kingdom gave charm to their meeting, which the memories of the past enwrapped around all objects within its scope. (Cheers.) He hoped and trusted that much less than half a century would elapse before they met there again. The United Industrious Lodge he was happy to say would be able to receive the Provincial Grand Lodge in its regular rotation with other lodges and so in nine or ten years in all probability the Provincial Grand Lodge would be again held at Canterbury. Again he hoped to be received in the admirable and comfortable manner in which they had been received that day. He congratulated Bro Steel (who for many years when the lodge was in abeyance paid the Grand Lodge dues and thus kept it on the register) on the resuscitation and promising condition of the lodge and on the events of that day. (Cheers.) The toast was drunk with great enthusiasm. Bro Holttum, Worshipful Master, in the name of United Industrious Lodge No.34 returned thanks. He expressed gratitude for the handsome attendance, which had resulted from their invitations and their delight at finding their arrangements had met with the approval of the brethren. (Cheers.) Bro Steel also returned thanks and expressed his gratification at witnessing the continued prosperity of the lodge, etc., and the Provincial Grand Lodge once more enabled to meet in their city. The health of the Provincial Grand Treasurer having been drunk and responded to, Bro Bisgood, DeputyPGM gave the health of the Provincial Grand Secretary, which was drunk with loud applause. Bro Isaacs responded assuring the brethren he had always felt the greatest pleasure in Freemasonry in which he had the honour to hold Provincial Office for twelve years. He again thanked them for the handsome testimonial with which they had presented him; which he trusted would be handed down as an heirloom to his children’s children to testify how well the brethren had appreciated his services. He felt that Freemasonry had made him a better man than he might otherwise have been and having had the charge of bringing up six brothers and sisters, it was gratifying to him to know that one of those brothers was now rendering a service to Freemasonry in a distant clime, having received an account of his Consecrating a new lodge in Australia. (Cheers.) The closing toast having been given the brethren separated about half past nine o’clock. The excellent singing of Bros Donald King, Lawler, Kingsbury and Young agreeably diversified the intervals between speeches. Shortly after the Provincial Grand Lodge meeting at Canterbury there was a series of letters published in the Freemasons’ Magazine regarding the fact that of one of the largest lodges in the Province only three brethren dined at the Provincial Banquet whilst nine other members preferred to dine at the Fountain Hotel. Debate ensued as to whether, not dining at the Provincial Banquet was disrespectful to Purton Cooper, QC, the presiding Provincial Grand Master with varying views subsequently being expressed. Acknowledgement: The author is indebted to Bro. Yoshio Washizu for his help in providing relevant pages of the Freemasons’ Magazine thus enabling the production of this Appendix.